Making a fake prop head for "A Lotus Til' Reckoning"
For the film, "A Lotus Til' Reckoning", a prop head was required for a scene where the actress, Kathleen McElfresh's head rolled across the floor. This was my first attempt at such a project, and I was overwhelmed, at first, trying to figure out how to do it. Well, the internet is a beautiful thing. After a week of research, I had a game plan. The best way I have found, when approaching a new project is to break it down into sections in a scientific order of operations. I knew the actress had been cast, and I needed a cast of her head. This first step is the same method I used when making the mannequin (see blog post here). Caution: There are many chemicals used in this process, read all the MTSD's before starting, and proceed with caution, and don't try this at home without a professional on hand. 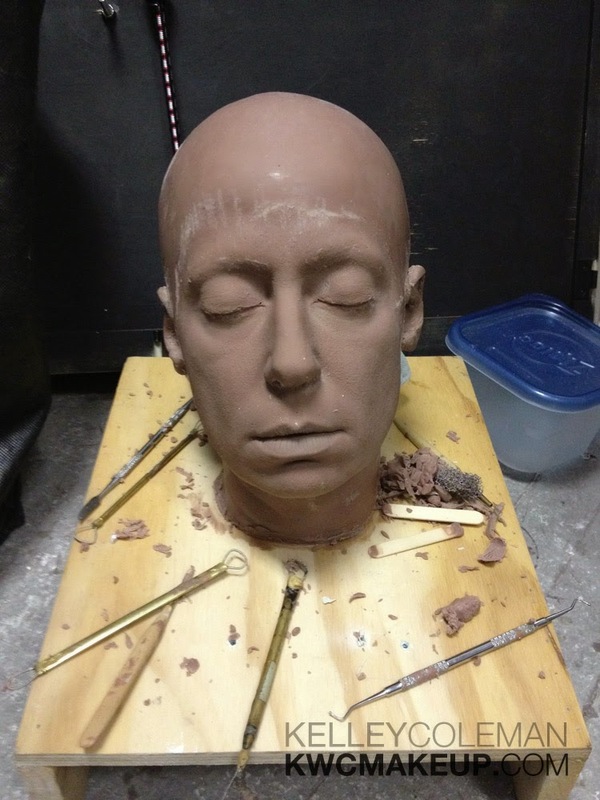 In the above photos, you can see a basic step by step of the lifecasting process. 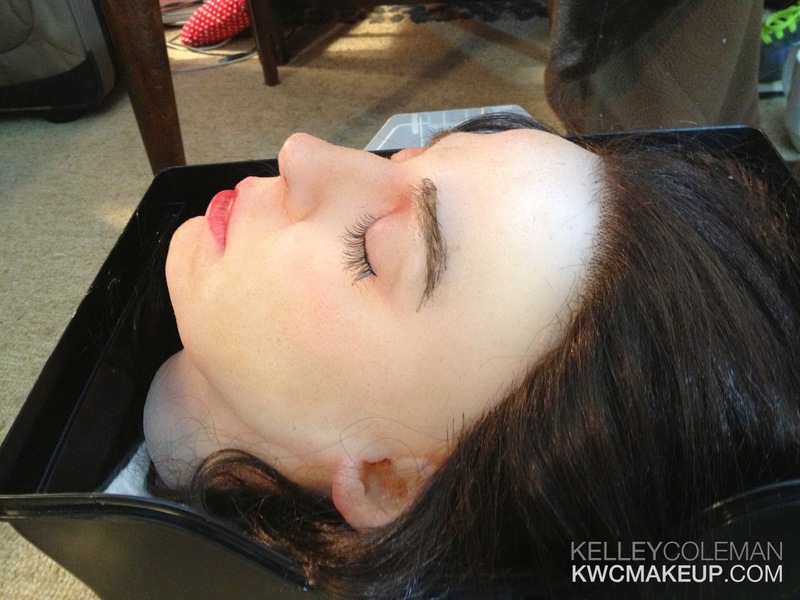 Kathleen was fitted with a plastic baldcap, which is a must if you are doing the lifecast with silicone. 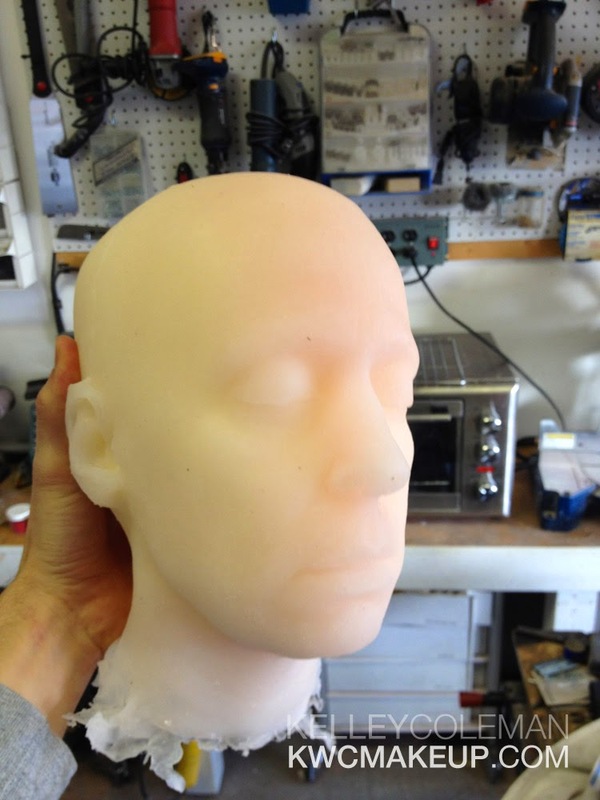 If you do a lifecast with alginate, you can opt for a cheaper latex cap, you will just have more cleanup work with the lifecast. The silicone I use is Body Double, from Smooth-On. This silicone makes a great impression, but it will stick to the skin if not released well with release agent or Vaseline. They now make a Body Double Silk, which self releases, but I have not tried it yet. Body Double comes in two forms, the regular and the fast set, and you want to use both. The reason being that the regular, purple silicone, is a thinner layer that will get all your detail beautifully. The green, fast set silicone is much thicker and will allow you to add bulk to the cast, giving it strength and warp prevention. Let the first layer dry before adding the next. You could do another layer of regular Body Double, but it will be thinner and take longer to set up. You want to be accurate with the cast, but not keep the actor in the silicone longer than they have to be! The whole process should take about 30 min. Once those layers are done, you must add a long silicone key up and around the ear line for the plaster jacket to have something to lock into. Do the back of the head, let it dry and vaseline along the edge before adding the front. Once everything is dry, remove the jacket starting with the front. When the jacket is removed, you must slowly cut up the back of the silicone up to the key line. Move slowly, you don't want to cut the actor's hair. While you are doing this, it is good to have the actor making faces to release the suction. When the mold is off, don't forget to clean off your actor! There is a great video on this whole process on the Stan Winston School site I would highly recommend watching before attempting this process for the first time. Once I had the mold all together I did a clay pour with my trusty Monster Clay. The best way to heat up the clay and adjust the temperature is with a small crock pot. You want the first layer to be pretty liquid to get the details, but after that, you can have the rest be warm enough that you can press it into place. I also filled the very core of the piece with aluminum foil balled up to save clay and money. I let the clay sit for a day to cool off before pealing it out of the silicone. I cleaned up the edges and the ears, which had an ear plug impression. I don't have a picture of the mold I made for this, but here is a link to Smooth-On's site where they demo the process. They use a product of theirs called Shell Shock,which you can do, but I just used Ultracal plaster. 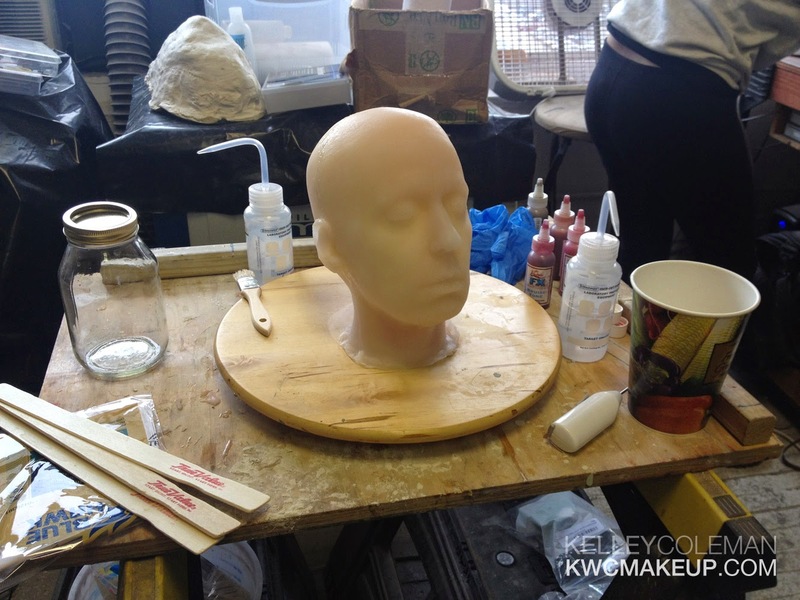 Here is the silicone head just after being pulled from the plaster mold. Smooth-On Dragon Skin 20 was used for the silicone skin with a drop of silc-pig flesh tone to intrinsically color the head. The silicone was first hand stippled with the mold open to capture the detail. This was such a thin layer that I did not use pigment. Once dried, The plaster mold was strapped together and more silicone with the silc-pig added. Dragon Skin 20 takes longer to dry than Dragon Skin 10, but because it's a little more fluid (20), I find that it has fewer bubbles, which is good when you don't have a degasser. I opted to not make the head entirely out of silicone for two reasons: 1.) Silicone is expensive 2.) Silicone is very heavy, and this head had to realistically hit a wall and roll across the floor. The core was filled with Smooth-On's FlexFoam-IT X. There are lots of versions, I find the X to be a nice fit between hard and soft. ** Be EXTREMELY careful if you decide to use a cold Urethane foam such as this. It is very dangerous to breath in. Wear a vapor respirator, gloves and have lots of ventilation. Once the head was demolded, it was cleaned with soap, and patched where needed. I used a technique on a Jamie Grove video I found on the Stan Winston School site. This method combines caulking silicone with Naptha and Alcohol activated airbrush colors. The only paint that will stick to silicone is silicone based paint. The Naptha is used to thin the caulking silicone down so it can go through the airbrush gun. I'm not going to get into the finer details of the technique, but I highly recommend the video. When I paint, I always start with reds and take it from there. The red brings life back into anything you paint and it gives you a nice starting point/ gauge of other colors that are needed. From there, I tend to move onto shadow tones, yellows, highlights and any color adjustment such as olive to cut too much warmth. I move back and forth between stream spraying and spatter depending on what is needed. Spattering the airbrush by turning the pressure way down is a great way to model and realistically color whatever you may be painting, especially if it is an organic texture like skin. I used a paache airbrush gun for this process. **Clean your airbrush thoroughly between colors to prevent clogging. **There is a lot of Naptha flying around in the air during this process, so please keep your mask on and be near good ventilation. I found that this process took a while to get used to, and towards the end I switched to hand coloring the Dragon Skin silicone and adding it by hand flicking with a chip brush and painting on areas like the lips and eyeliner. The last step in the process was punching the hair. I purchased a lace front wig that I glued on and punched extra hair around the front for added realism. The eyebrows were the trickiest part, and I found that leaving some of the hairs longer added for more realism. Female eyebrows tend to be more arched and thinner than male brows. 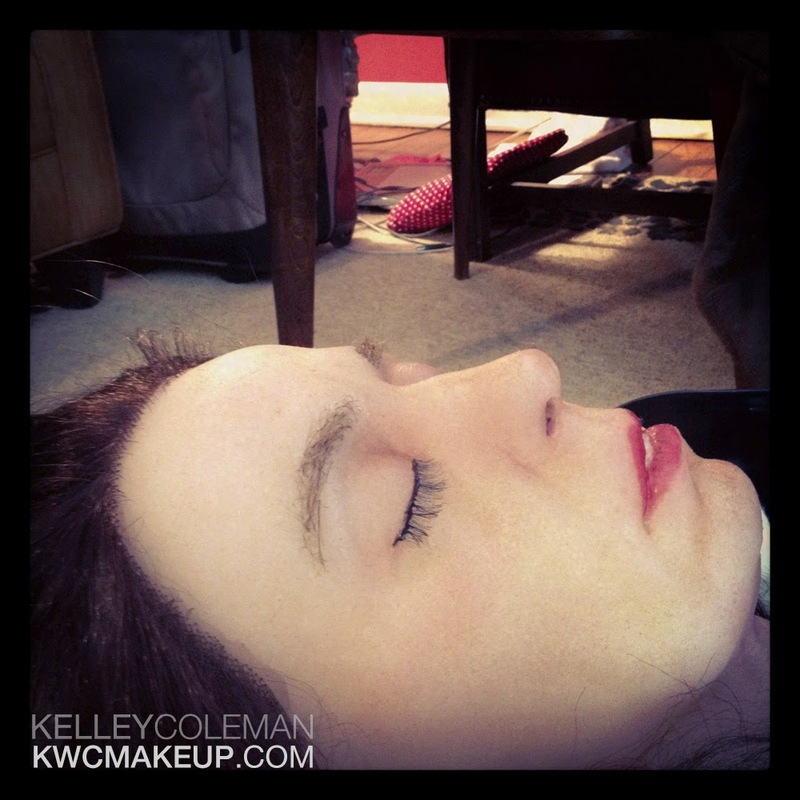 I used fake lashes that matched the ones the actress wore and glued them on with silicone. If you want a more natural lash, I recommend punching them hair by hair. Hope you enjoyed reading the post! Comment or ask questions below.